The decision on whether to give children pocket money, at what age, and how much will largely depend on your family values and financial position. Some parents view pocket money as sharing the family’s income between all family members whilst others use pocket money as a reward for contributing to the household chores and responsibilities. Research by the Commonwealth Bank shows 80 per cent of parents give their children pocket money; and the same survey showed 92 per cent of parents feel chores should be done regardless of any monetary reward system. Irrespective of how pocket money is calculated, when paid to children and used wisely, pocket money can be an excellent way to help children develop money management skills and independence. The value of money. Having to buy things using their own money helps to teach children the relative price of everyday items and luxury items. It can help them to develop an appreciation for the cost of living. The difference between needs and wants. If you are clear about what you expect children to buy with their pocket money it helps them to understand the difference between what they need, what they want and what they can afford. As children get older, some parents increase pocket money to teach children to budget for clothes and entertainment, helping them to learn to prioritise their purchases. Savings habits and budgeting skills. Having children set aside a portion of their pocket money for savings first and allow them to spend what is left over can help them develop savings techniques. The Raising Children Network suggests an interesting strategy of using jars to separate their pocket money. That is, one jar for the small things they want now, and another for saving towards bigger things. Paying children’s pocket money in coins helps them allocate specific amounts in this manner. A child could have a few different jars to split up their pocket money depending on their spending and savings habits. Banking skills. 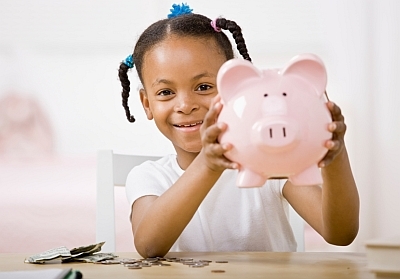 Parents can teach children to bank or invest a portion of their pocket money. Showing children how to make a deposit of their savings at the bank gives them a sense of responsibility and helps to teach them discipline and savings habits. Importance of goal-setting. When kids really want something, using pocket money to work towards acquiring it can help teach them the art of goal-setting whilst demonstrating the reward that having to wait for something can provide. Encouraging children to stick to their goals with a little effort and focus can help them to develop discipline. Borrowing. For more expensive items, parents can introduce the concept of borrowing by asking children to contribute from their savings, whilst loaning them the balance for the child to repay out of their weekly pocket money. This can help to teach children the concept of debt and lending and the responsibility of making repayments. The consequences of having repayments deducted on a longer-term basis can also help to encourage more thoughtful spending. Responsibility and co-operation. If pocket money is linked to the completion of jobs and household chores then it can be helpful to display allocated jobs on on a chart of schedule so the children are clear on what is expected of them. Allowing children to swap jobs can encourage flexibility and co-operation among siblings. Ultimately, children learn a lot by watching their parents deal with money. Spending, budgeting, saving, withdrawing or donating money are all opportunities to teach children about the basics of managing money.